Top: Primark. 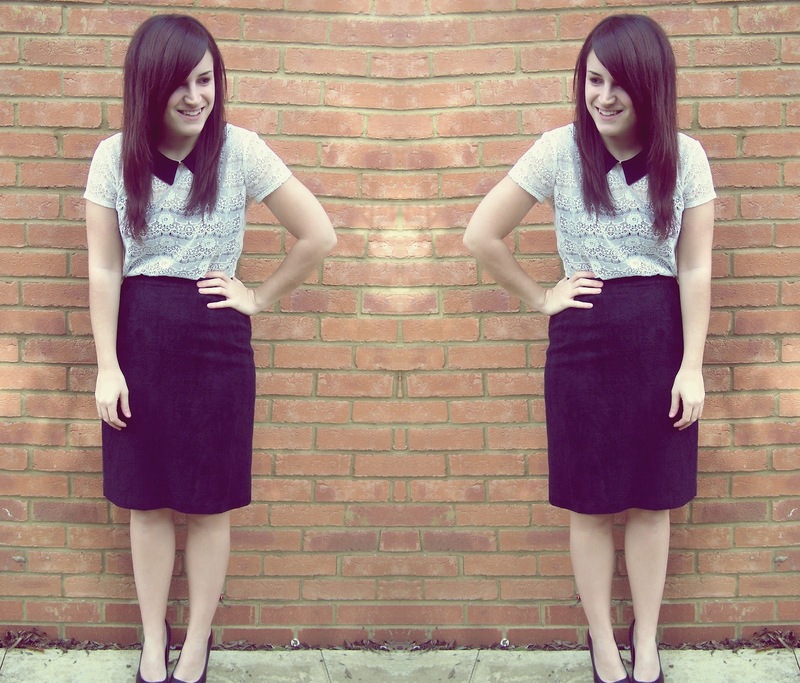 Pencil Skirt: Charity shop (via Marks and Spencers) Heels: New Look. I feel like I should either be hanging out with Victoria Beckham, or sitting at a desk on The Apprentice, in this ensemble. I say that, I've never watched The Apprentice (stop shaking your head at me) and Vikki may not really be that much fun to be about. This is my first ever pencil skirt. Shocker I hear. Well yes, it saddened me too that I've spent many moons without one. But I'm that girl, with the small waist and big bootay. So pencil skirts really are hard to find that DO fit a dream. Believe me, I've spent many intimate hours in changing rooms, trying to squeeze my bum into a tight one, or hair gripping the waist on another. And then came along this one. This £3.50 one I must add. Just in my local charity shop. Sitting there, waiting for me to home it. And I did. Because it fitted like a dream. A really soft dream. I say it fits like a dream. It managed to get over my rear. Which in my eyes made it a winner all round. I also love how perfect it sits on my waist. Not too big, but still enough room to consume huge amounts of cheese. I think I'll stay clear of the tubes when wearing it though. Because if anyone sees me from the back, they'll take one glance and think they've struck lucky with a seat.